If you’ve got good shoulder mobility, then your overhead position is good… Wrong! There is more to a good overhead position than just the range in the shoulders. The fact of the matter is, a lot of courses and reading material do not cover thoracic spine mobility and how thoracic spine extension helps create more range for the overhead position, I’m talking perhaps 10 to 15% more, that’s a hell of a lot. So why is there not a whole topic on this when it’s so important? What is a better overhead position? Better equals the weight resting on the skeletal system versus resting on the muscular system. The amount of extension required completely depends on the persons shoulder mobility. The range achieved through the thoracic extension should be natural, i.e. chest out, shoulders back, at no stage should one achieve hyperextension. I’ve decided to make a video for you that demonstrates the range achieved through thoracic extension, but also created a infographic and PDF (1,724 words) you can download. Access is free for all members, just register or use one of the social buttons below for easy registration, if you’re already signed in then you should see the link below to download the PDF. Download the PDF with infographic and other details here for the overhead lockout. 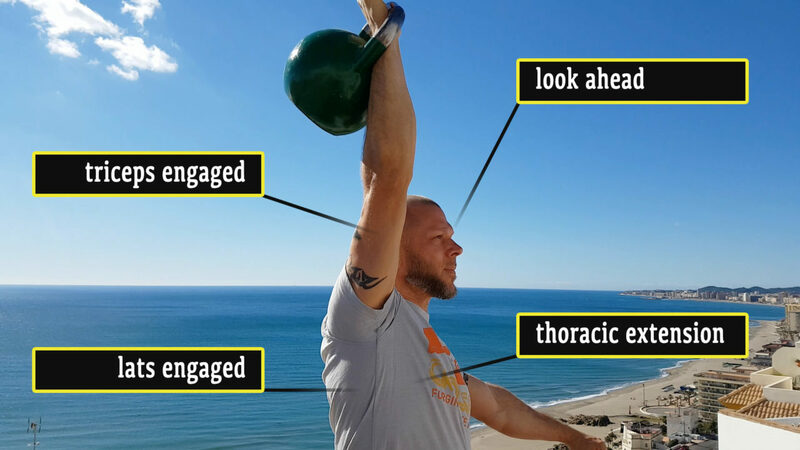 Yes I’m working with a kettlebell, but the same concept applies in CrossFit, whether you’re working with a kettlebell or barbell, you create more range through your thoracic. While on the topic of lifting, I think very soon it’s time for an article on the position of the wrist with overhead barbell lifts, there’s already enough hyperextension in the rack, so lets fix some of that, as it can be prevented all together. Take a few moments and help others by sharing and liking. As always, your feedback is appreciated, without you there is no Cavemantraining.com, leave your comments below or on this Facebook post. Overhead lockout through thoracic extension by Cavemantraining / Taco Fleur is licensed under a Creative Commons Attribution-NonCommercial 4.0 International License. Based on a work at https://www.cavemantraining.com/caveman-kettlebells/overhead-lockout-for-kettlebells-and-crossfit-barbell. This basically means that you can re-use the material provided as long as proper attribution is provided, i.e. linking and listing the authors name. In case you missed the video at the top of the page, here it is again.